Compaq Logo. Courtesy of oldcomputers.net. Image available on the Internet and included in accordance with Title 17 U.S.C. Section 107. 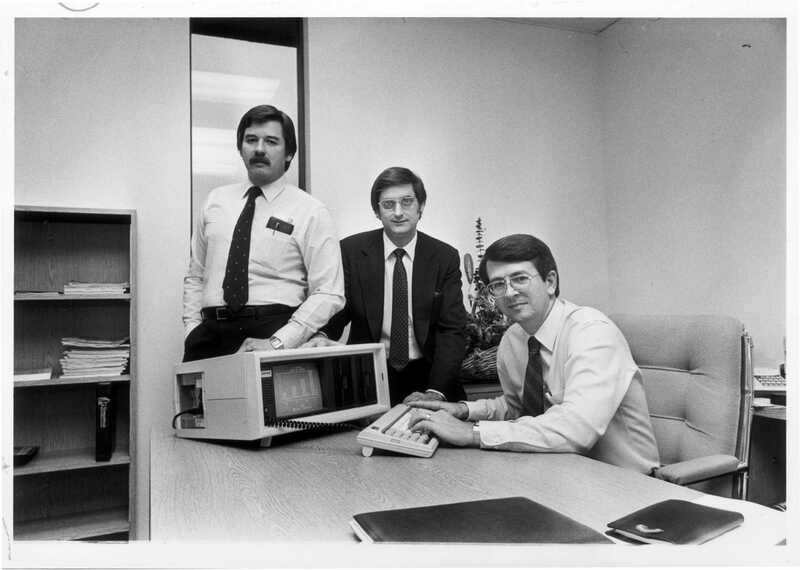 Compaq Computer Corporation founders, James "Jim" Harris, William "Bill" Murto, and Rod Canion with their portable computer in 1983. Courtesy of the Houston Chronicle. Image available on the Internet and included in accordance with Title 17 U.S.C. Section 107. COMPAQ COMPUTER CORPORATION. In 1982 the Houston economy was entering one of its bleakest periods of its almost 150-year history. The price of oil was falling precipitously and the energy-centric economy in Southeast Texas was falling right along with it. In August 1981 IBM took advantage of the power of newly-developed microprocessor technology to successfully introduce the first IBM Personal Computer. The new PC industry was born and was exploding with the extraordinary potential that Spindletop had demonstrated eighty-one years earlier. The shift from an industrial economy to one based upon information and services was being hailed as being as transformative and empowering as the discovery of plentiful and cheap oil had been almost a century earlier. The race to claim a piece of the tremendous profits that this shift promised included large, well-established computer companies as well as dozens of new start-up operations that seemed to appear weekly. The gusher of wealth that would flow from this new stream of electronic gold seemed very out of place in the 'old economy' corporate culture of "Big Energy" Houston. The new, information-age business culture was said to be more grounded in the entrepreneurial climate of Silicon Valley in California and the Route 128 corridor around Boston. That is, until three senior engineers from Texas Instruments sat down to dinner at a House of Pies on Westheimer Road in Houston. Rod Canion, James Harris and William Murto each had $1000 to invest. They discussed the possibility of managing a Mexican restaurant, making storage devices for minicomputers or, perhaps, a beeping device to help locate lost items. Instead, on the back of a HOP placemat, they did their initial sketch of an IBM-compatible PC that was small enough to be transportable. In the days before technology allowed for components to be shrunk to 'laptop' size, the Compaq luggable had its first design. Drawing, Model of the earliest Compaq computer. Image available on the Internet and included in accordance with Title 17 U.S.C. Section 107. Photograph, Compaq Computer Co, founders with their employees. Courtesy of the Star-Telegram. Image available on the Internet and included in accordance with Title 17 U.S.C. Section 107. Dozens of companies were entering the market to produce IBM-clones and competing for finite venture-capital funds. Nonetheless, Compaq secured the backing of Ben Rosen, a noted venture capitalist and president of Sevin-Rosen Partners, who invested $2.5 million and became the company's first Chairman. Compaq Computer Corporation was born in February 1982. Compaq's early success was unparalleled in the annals of American business history. It sold 53,000 units for over $111 million in its first year of operation in 1983. Its early staff of twenty well-seasoned computer industry professionals rapidly grew to 600 in that first year as Compaq differentiated itself from its start-up peers by relying upon industry veterans and by instituting a marketing strategy that rewarded, rather than competed with, a growing network of retail dealers. This was in marked contrast to other companies of the era who sought to fill demand channels by any means necessary, directly or indirectly. This often meant that a company's direct sales force would compete with the company's dealers for large sales to corporate clients. Compaq's non-compete policy bred loyalty among the many retail chains then offering local service. Compaq's reliance upon experienced personnel was contrasted by the tactics of many of the new competitors of the era, most of whom are long bankrupt, who tended to hire young, aggressive people who focused on short-term survival. Compaq Computer Corporation campus in suburban Houston, TX. Courtesy of Bellows Construction. Image available on the Internet and included in accordance with Title 17 U.S.C. Section 107. Compaq grew rapidly as it spread across 150 wooded acres in the suburbs northwest of Houston. Sales escalated to over $500 million in 1985 when Compaq began trading on the New York Stock Exchange, and in 1986 it became the first company in history to claim a place on the Fortune 500 list in only its fourth year of existence. 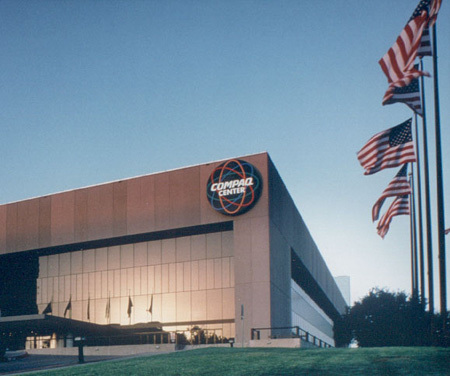 Expansion into Europe and Asia followed quickly, and Compaq ranked 157 on the Fortune list in 1989, with sales of over $2 billion, when it successfully met an important challenge. IBM had, of course, developed the first IBM PC. It did not invent any of the crucial components, however. It sourced critical parts like the microprocessor from Intel, the operating system from Microsoft, etc. This allowed any potential competitor to do the same. Companies like Compaq could source the same components and produce systems that were internally compatible to IBM's. In an effort to recapture a technical and marketing advantage, IBM developed a proprietary internal bus structure called MicroChannel and a complementary OS (operating system) called OS2. This threatened to cut off all competitors by making their systems incompatible with the IBM architecture. Software companies would have to develop multiple versions of code and peripheral device-makers would also be forced to choose between the two or else to double their development costs. Large corporate end-users, who benefited from the cost-savings-driven options presented by the IBM-compatibles, would risk having a burdensome mix of equipment on their premises, greatly adding to infrastructure costs. Since the MicroChannel architecture provided significant performance enhancements, all clone manufacturers would have to spend millions in development costs to compete in a fragmented market. The losers would be consumers and thousands of stakeholders in the clone-manufacturing community. Compaq was perhaps the only company with the size and influence within the industry to reverse this situation. It rapidly funded the prototype EISA Bus (Extended Industry Standard Architecture) and opened the engineering specs to any and all users. A consortium of computer and peripheral companies quickly formed around this standard and offered a strong alternative to the IBM product. Within a year, IBM also adopted the EISA standard and the concept of open-systems within the PC industry was preserved. Closed, proprietary systems killed the once-vibrant minicomputer industry and caused the mainframe market to stagnate. It is almost impossible for industry observers today to envision how the growth of networking and the Internet would have been possible if IBM-dominance had been permitted to stymie open competition on the desktop. Early version of Compaq's desktop. Courtesy of History of Computing. Image available on the Internet and included in accordance with Title 17 U.S.C. Section 107. Compaq's growth through the later 1980s mirrored that of the PC industry as a whole. Compaq consistently surpassed industry benchmarks, however, and much of that performance can be attributed to its rapid product development cycle. It was usually first to market as new versions of standard components were introduced as, for example, it was first with the release of systems based upon Intel's 386 chips. It beat IBM by six months and grabbed significant market share. By 1994 it had passed IBM to become the world's largest PC manufacturer. Photograph, Compaq's second CEO, Eckhard Pfeiffer. Image available on the Internet and included in accordance with Title 17 U.S.C. Section 107. Such growth did not come without problems. In 1991, after posting sales of $3.6 billion and profits of $455 million in 1990, Compaq announced a decline in numbers and a $70 million third quarter loss. Canion was forced to resign as CEO and was replaced by Eckhard Pfeiffer, the head of Compaq's European operation. Compaq quickly regained footing and in 1992 announced a remarkable sixteen new products, including its first printer. The product line was expanding in both directions, with lower cost models aimed at the home-consumer market as well as higher-end machines designed for the corporate server market. The use of industry-standard components can be healthy for end-users but will generally put pressure on manufacturers. Standardization breeds commoditization which often makes price the product differentiator. Low margins drove many PC-makers out of business in the 1980s and 1990s. The survivors learned to add value to the commodities so they could command premium prices. In the computer market, this may mean first-to-market, additional features or enhanced service. Compaq employed all of these methods. In an effort to generate more service revenues, Compaq embarked on a bold acquisition plan in the late-1990s. In 1997 it paid $4 billion to acquire Tandem Computer Incorporated. Tandem was a pioneer, and the market leader, for fully-redundant, fault-tolerant computers. These were systems that were essentially guaranteed to never have any downtime. A fault in any component was protected by the operation of an identical component that ran along-side it. Every single piece of these large, complex machines was duplicated by an identical piece that assumed control in the event of a component failure. These systems were expensive, difficult to program and required specialized service. The customers who required full fault-tolerance, like the ATM networks in large banks, the process-control industries, etc., were willing to pay a premium for this feature. Compaq saw this as a way to generate more service and consulting revenue while opening potentially lucrative new markets for its core product line. 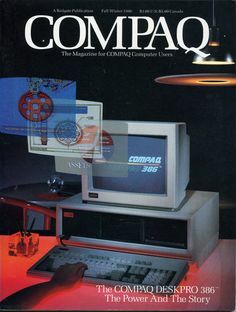 Compaq Magazine. Image available on the Internet and included in accordance with Title 17 U.S.C. Section 107. In January 1998 Compaq took this strategy further. It agreed to acquire Digital Equipment Corporation for $8.55 billion. DEC was an icon in the development of the computer industry. Formed in 1958 outside Boston by Ken Olson, it invented, developed and dominated the minicomputer market. Its PDP-11 minicomputer, produced in the mid-1960s, changed the face of computing around the world. Throughout the 60s and 70s and 80s, DEC earned a reputation for technical excellence, innovative product design and superb service. It trailed only IBM in worldwide sales and had a customer base of tens of thousands of long-time customers. In the 1990s, however, DEC was falling upon hard times. It failed to respond to the industry movement to open systems and stubbornly clung to its proprietary architecture. Its product line was under severe pressure from below by the advent of high-performance workstations made by Sun, Apollo and others. The high-end of the product family was wilting under competition from the Unix-server vendors like HP and IBM. Networked PCs were supplanting minicomputers in the mid-size market. DEC still retained some formidable competitive advantages. In addition to its valuable customer base and its lucrative, recurring service revenue, it possessed some impressive technology like its Alpha RISC chip design and its AltaVista program, among the first Internet search engines. Its research and development capabilities, while dwindling, were still among the best in the industry. Wall Street's reaction was decidedly mixed. 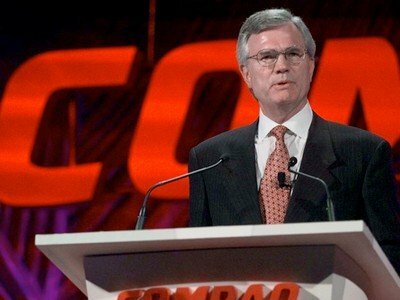 While it acknowledged that Compaq needed to diversify and reduce reliance on its core PC market, mergers within the computer industry have had a dismal record. Compaq was swallowing two large companies in a short period of time. Employee totals jumped, with 22,000 consultants being added in the DEC deal alone. This did not account for the additional sales, manufacturing and administrative personnel also being incorporated into Compaq's operations. Layoffs commenced directly with 5000 employees being severed almost immediately. Revenues increased dramatically, shooting to $31 billion in the combined 1998 statement. Compaq's core PC/peripheral business, however, showed signs of serious erosion from foreign and domestic competitors and the resultant lower prices. 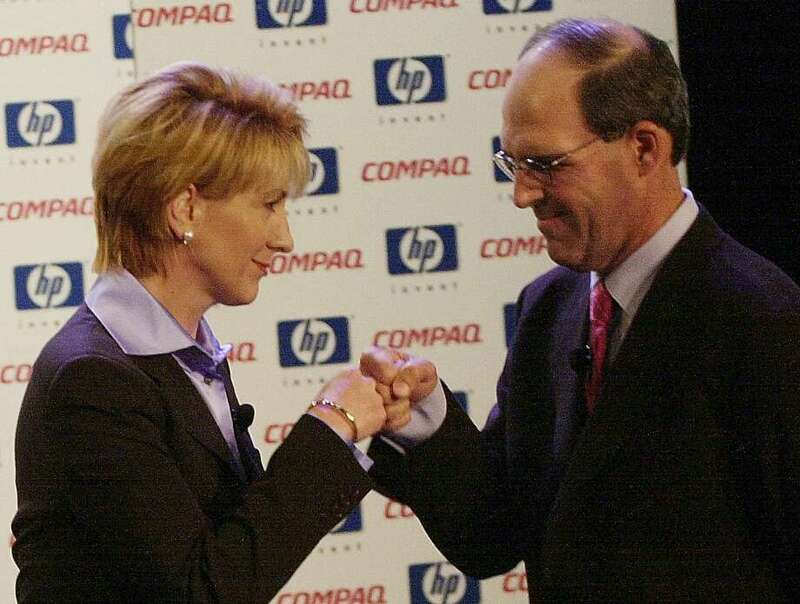 Photograph, Hewlett-Packard's Carly Fiorina and Compaq's Michael Capellas bump fists in February 2002 after announcing the merger. Courtesy of the Houston Chronicle. Image available on the Internet and included in accordance with Title 17 U.S.C. Section 107. Compaq struggled with merger issues for the rest of the 1990s. It badly missed earnings targets in the first quarter of 1999, resulting in more job cuts, a twenty-two percent decline in share price and the ouster of Pfeiffer as CEO. He was replaced by Michael Capellas, Compaq's CIO. The case may be made that Compaq failed to allow for the full impact of the Internet and networking technologies. DEC's business could not recover its previous vitality. The proliferation of low-cost microprocessors had relegated the proprietary mini to the dustbin of history. The Alpha chip, although a formidable technical achievement, could not keep pace with the rapid developments in this field. Full RISC implementations had fallen out of favor due to the limitations of the instruction sets. Vendors that used industry standard chips could avail themselves of much more frequent product upgrades. Likewise, the concept of fault-tolerance that was pioneered by Tandem also lost a great deal of its compulsion due to the widespread utilization of Internet and intranet applications. Tolerance could be provided 'in-the-cloud' in many cases, eliminating the need for expensive hardware redundancy. Although, Compaq made a concerted effort to integrate Internet technologies within almost all aspects of its product and business planning cycles, factors in the fast-moving marketplace vastly degraded the value of these investments. Domestic and international competition continued to plague Compaq. In 2001, Dell Computer of Round Rock, Texas, surpassed Compaq's PC/Workstation sales to take over the number one spot in this market. Asian competitors offered stiff pricing pressure that lowered margins for all industry participants. Facing a difficult outlook, Compaq agreed to a $21 billion merger with Hewlett Packard Corporation of Palo Alto, California. Despite fierce opposition from the family of founding-partner Bill Hewlett, the merger was approved by shareholders of both companies in 2002. Carly Fiorina, HP's Chairwoman and CEO, led the combined companies. Layoffs eliminated over 16,000 jobs in 2002 with another 5,000 attributed to the merger in 2003. By 2003 Compaq ceased to operate as a separate company and all merger functions had been completed. HP has gone on to post record revenues and earnings for 6 consecutive quarters into Q2, 2006. Compaq Building in Houston, TX. Image available on the Internet and included in accordance with Title 17 U.S.C. Section 107. Compaq was the first highly visible, high-technology company to be founded and run from Texas. Houston and other cities in Texas had impressive technical communities. The vast engineering communities supporting the oil and gas industries and NASA in Houston, the telecom corridor that was developing north of Dallas, a burgeoning high-technology foundation in Austin, the Texas Medical Center in Houston, as well as some premier research universities within Texas were all world-class entities. Despite this, the image of Texas was still beholden to that of the Old West and wildcatting Texas oilmen. Compaq was a key step in updating that image to reflect the impressive intellectual capital of the state. Timothy F. Bresnahan, Scott Stern and Manuel Trajtenberg, "Market Segmentation and the Sources of Rents from Innovation: Personal Computers in the Late 1980s," RAND Journal of Economics Vol. 28 (1997). Compaq Company History (http://web.archive.org/web/20050331034315/http://h18000.www1.hp.com/corporate/history.html), accessed April 11, 2007. ComputerHope.com, "Compaq" (www.computerhope.com/comp/compaq.htm), accessed September 2006. Houston Chronicle, December 29, 1985, News section. Handbook of Texas Online, Michael Frontain, "COMPAQ COMPUTER CORPORATION," accessed April 19, 2019, http://www.tshaonline.org/handbook/online/articles/dnc01.